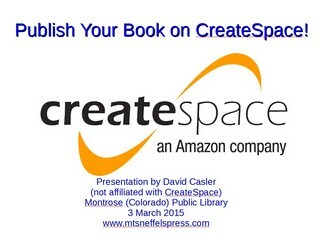 Here are the slides I presented last night describing how to publish on CreateSpace. Clicking on the slide will bring up a rather large PDF file; please be patient while it loads. Please note that although I publish several books on CreateSpace, I have no other attachment or affiliation with them. 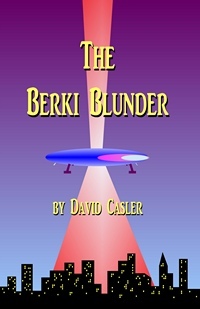 The Berki Blunder is now available two ways: via our Fantasy Catalog, and directly from Amazon. An alien ship, in trouble, lands on Hollywood Boulevard. Bad enough? And it’s the day of the big premier of the SciFi movie Asteroid, so they land amid huge crowds. It gets worse… One of the crew members is lost trying to find a bathroom. Two earthlings who help replace the broken motivators won’t leave the ship. And the U. S. Air Force has them surrounded. What are the poor Berki to do? The Berki are aliens. We’ve heard everything about aliens, right?—how they’re so advanced they’ll order us around, or so cute we want to cuddle them, or so evil they’ll destroy us. But what if they’ve figured out interstellar travel, but not much else? The earth would certainly seem mysterious: advanced cities, cell phones, and blockbuster movies. And this strange thing called the Internet, which they fear is a form of magic they’ll be unable to duplicate. So they fly around and gather what information they can. And maybe look for a lost comrade while they’re at it. That is, as long as their spacecraft works properly. They’re on the Periwinkle, a Maginator-class spacecraft, a class not known for its reliability. Welcome aboard! 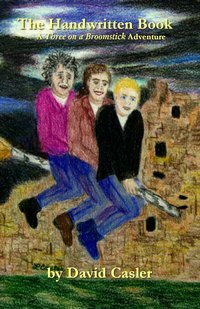 I’m pleased to announce that The Handwritten Book, the first book in the Three on a Broomstick series, is now part of the Fantasy Catalog here at Mt. Sneffels Press. My original intent had been to put it on Kindle only, but then I tried CreateSpace, the Amazon arm that helps people like me turn their manuscripts into softcover books. I was delighted not only with the process, which was rigorous but straightforward, but also with the quality of the printed copies. You can buy The Handwritten Book on Amazon too! In fact, if you’re an Amazon Prime member, you can get free shipping, something I can’t offer to those who order from the Fantasy Catalog. Plus, since it’s a “print on demand” book, they never run out, even if millions of copies are ordered. And the wholesale printing costs are great too, even with shipping from them to me. So, you can have it three ways: buy softcover from me, buy softcover from Amazon, or buy the Kindle version from Amazon. Shipping costs have gone up for 2014. I’ve changed shipping and handling charges for books under 1 lb to $3.50 and $4.00 for those items above 1 lb. Note that if you use the shopping cart feature, you may be able to save quite a bit on postage. For example, if you purchase both the Galloping Goose book and the Railroad book at the same time, your aggregate shipping and handling is only $4.00. 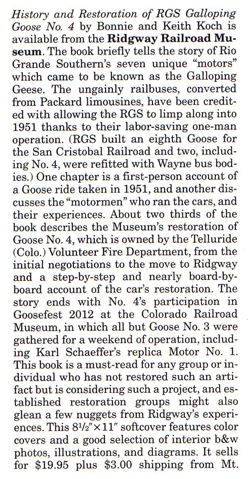 The following review of the Ridgway Railroad Museum’s History and Restoration of RGS Galloping Goose No. 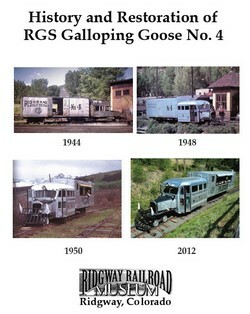 4 appeared in the November issue of Railfan & Railroad Magazine. You can order the book by clicking on this link. NOTE NOTE NOTE: Shipping rates have gone up because of the Post Office rate increase. If purchasing by check, the shipping and handling is $3.50, not $3.00 as stated in the article. Workshop on dialog in narrative fiction. Local author Dave Casler leads another writer’s workshop, this time on developing compelling dialog in narrative fiction. Learn how to make dialog realistic, compelling, and a key part of your storytelling. Dialog makes fiction come alive and provides a portal into our characters. It also pushes the story forward, informs the reader, and draws us into the book or short story. There are two sessions, both in workshop format. Bring with you samples of dialog you’ve written or particularly admire (or don’t admire!) and we’ll look at it together. Several exercises are provided in class to hone various aspects of dialog writing. All critiques are positive and gentle! The workshop is for the young and old—those under 14 should be accompanied by a parent who participates in the workshop. Between the two sessions, participants complete exercises at home designed to heighten you awareness of dialog, which we’ll share at the second session. Participation is free and open to the public. Please plan on attending both sessions. And, here’s the Feb 2013 Dialog Workshop Class Handout, which you can print and bring with you. I’ll also have copies at the workshop. Beth’s new poetry book, Canyon Notes, is available from Mt. Sneffels Press here. Recently, the director of the Ouray County Chorus, David Vickers, set one of Beth’s poems to music. Watch her read her poem and hear the chorus’s beautiful rendition. I hope to see you at the upcoming workshop! It’s all about settings – creating a fictional world in which your characters live. It will be held at the Montrose (Colorado) Public Library meeting room right off the main lobby at 7:00 p.m. It will be entirely in workshop format. You can find the exercise worksheets by clicking here, which takes you to Google Docs. See a longer description of the workshop here. And you can see the announcement on the Library’s website here.